Feedback surveys are sent to all participants after they have completed on of our activities, courses, or events. These surveys are designed to help our leaders and committees improve our programs! The Mountaineers has several different feedback surveys that allow participants to give feedback after attending an activity, course, or event. Candid feedback allows those who lead, teach, and administer our programs to continually improve their personal leadership and the quality of our programs. Learn more about the importance giving and receiving feedback on our blog! Feedback surveys are available the day after an activity, course, or event ends. All participants will receive an email prompting them to provide feedback, but they may also give feedback through the My Activities or My Courses page of their Profile. Trip Feedback - Sent to all participants following a trip. Course Feedback - Sent to all course participants after the final day of the course. Course Instructor Feedback - Sent to all course instructors after the final day of the course. Field Trip, Lecture, Seminar & Clinic Feedback - Sent to all participants following a field trip, lecture, seminar, or clinic. Field Trip, Lecture, Seminar & Clinic Instructor Feedback - Sent to all leaders and instructors following a field trip, lecture, seminar, or clinic. Event Feedback - Sent to all event attendees. If you are running a new program and you would like to include a specific set of questions in your feedback survey, you many consider creating a custom survey with our Survey Gizmo account. Please note! If you want to change the default survey or make a custom survey in Survey Gizmo, this needs to be completed and connected to the activity, course, or event before registration opens. Feedback surveys may be added to past activities, courses, and events by editing the activity, but this will not generate a new email. Those feedback surveys will only be accessible via the "Give" feedback link on the My Activities or My Courses pages. Prior to August 2015, The Mountaineers only sent surveys for "stand alone" trips, and occasionally for courses. The trip surveys were administered through SurveyGizmo, and they were managed by a single volunteer. Survey responses were collected and then distributed to leaders and committee chairs, but only once or twice a year. The survey responses were also stored separate from our website, so it was not easily accessible to our members or volunteers. We now have a much-improved process that provides immediate, accessible feedback and it is fully integrated with our website! The day after an activity or event ends, click the "Give" link in the "Feedback" column on your My Activities page. 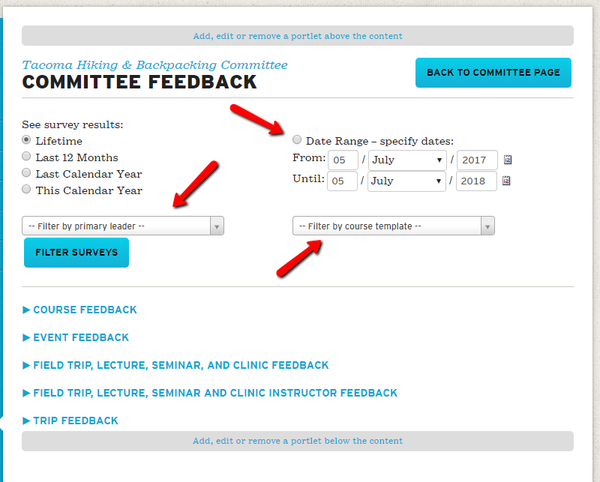 The day after a course's end date, click the "Give" link in the "Feedback" column on your My Courses page. Please note that feedback is not editable, so be sure to review what you've entered before pressing "Submit"! You can view the feedback you've written by clicking the "View" links on your My Activities and My Courses pages. After an activity, course, or event has finished - if you were registered - you'll find "Give Feedback" and "View Feedback" buttons on the right side of the "detail" page. Email reminders, including a link to the associated feedback survey, are automatically sent to all participants the day after the end date of the activity, course, or event. Your feedback is anonymous. Leaders and committee administrators who can review feedback are only able see the text responses. They are not able to see who provided the feedback. If you report a safety concern as part of your feedback, we will share your concern, name, and contact info with our Safety Committee. The Safety Committee may contact you for more information, but rest assured that they will keep your information completely confidential. where do i find feedback I've received? Leaders may view their feedback by clicking the "All" link in the "Feedback" column of their My Activities and My Courses pages, in addition to the "All Feedback" buttons on the activity, course, and event "detail" pages. Committee administrators have access to the above information all of the leaders on their committee. Committee admins have access to their committee aggregated feedback through their committee page. Click on the “View Committee Feedback” button on the right-hand side of your committee’s homepage. One you’re in your committee’s homepage, you can filter feedback by primary leader, within a date range, and/or by course template. 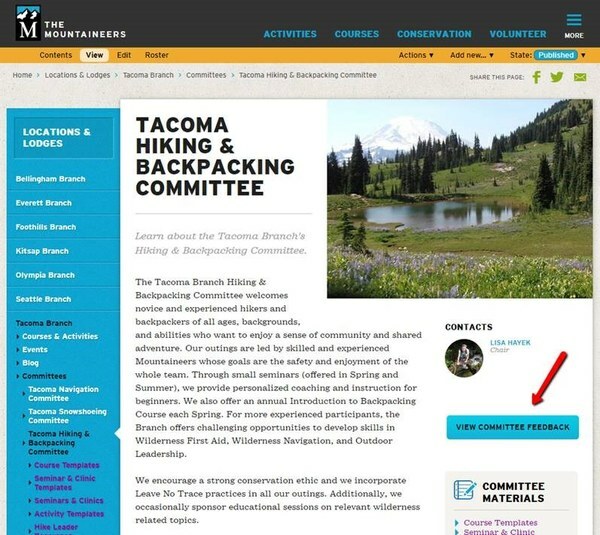 Click the blue “Back to Committee Page” button in the top right-hand corner to exit this page. Members with “Admin” permissions on an activity committee roster are be able to see aggregated feedback for all of the activities that have been sponsored by their committee. Those with “Admin” permissions on a branch roster will be able to see feedback for any of the activity committees in their branch. If you’re unsure whether or not someone has “Admin” permissions on your committee, please look in the “Group” column of your committee roster.